For China, pursuing global economic leadership is not just a goal. It’s an imperative. 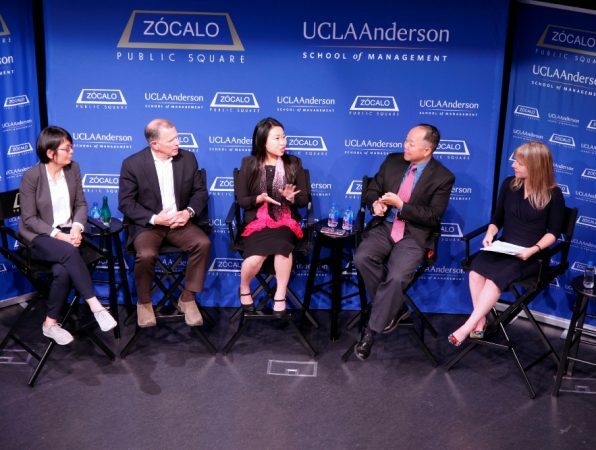 That was the message from panelists at a Zòcalo/UCLA Anderson School of Management event, “Is China Prepared to Lead the Global Economy?” at the National Center for the Preservation of Democracy in downtown Los Angeles. China is seeking global economic leadership, panelists said, as Chinese President Xi Jinping made clear at the recently concluded 19th National Congress of the Chinese Community Party. “They want to make China great again,” quipped panelist Jerry Nickelsburg, director of the UCLA Anderson Forecast. And, 40 years after the opening up of China under Deng Xiaoping, China has achieved global leadership in several areas, including mobile platforms and mobile finance. The event moderator, former Los Angeles Times Beijing bureau chief Julie Makinen, lamented that when she returned to the United States, she lost the ability to pay easily for items—even flowers from a street vendor—with WeChat, which is ubiquitous in China. But the panelists, in a variety of ways, suggested another Chinese motive for pursuing global economic leadership: It has to—if it’s going to deal with its own internal challenges. 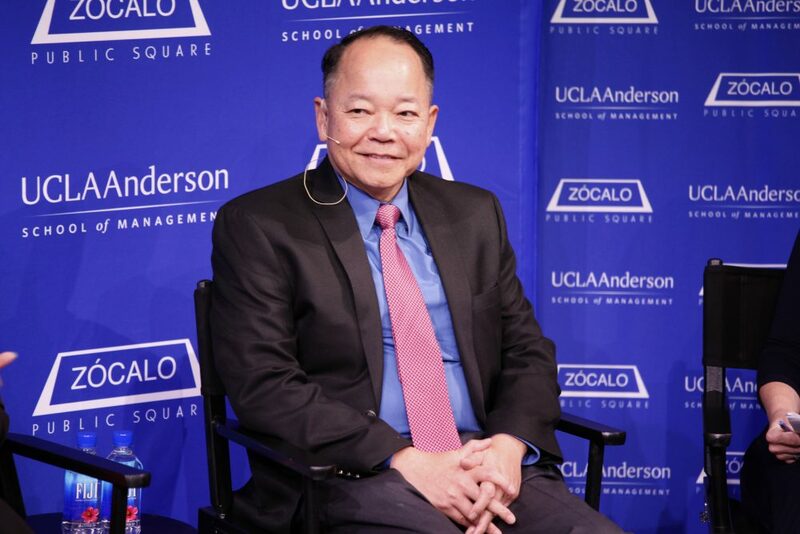 Christopher S. Tang, the Edward W. Carter Chair in Business Administration at UCLA Anderson, said China was following the path of previous empires, including the British, that conquered the world by global trade. It’s also seizing an opening left by the United States, which pulled out of the Paris climate accords, to seize environmental leadership. But China also needs to make big environmental strides to address its own problems with water and air pollution. “Now China is thinking maybe they can take the lead. Why not turn it around and be a leader?” Tang said. He noted the country’s pioneering efforts in solar panels and its aggressive development of electric cars. China is also seeking to lead in innovation—not only as a way of earning global respect, but because of its own economic challenges. “The hidden message” of government calls for more entrepreneurship and innovation, Tang said, “is the economy is slowing down. There are not that many jobs. Labor costs are growing rapidly.” So entrepreneurs are needed to produce new jobs. Nickelsburg, director of the UCLA Anderson Forecast, said that China, although it now rivals the United States in the size of its overall economy and in trade, remains a poor country that is not blessed in natural resources or farmland. So it needs to trade and build infrastructure links in other countries in order to procure an adequate food supply—which, in turn, is essential if the communist regime wants to keep control over the country’s massive population. “They need to trade, because having hungry citizens is not really a recipe for staying in power,” Nickelsburg said. Yiwen Li, a young biotech executive who works for U.S. companies that expand globally, marveled at the changes in her native city of Wuhan, where her family lives, that have resulted from China’s growing links to the world. More progress—and more global leadership—is essential internally, she argued, in part because of changes in demography. She pointed in particular to the need for China to become a leader in health care, because its longtime one-child policy and other demographic factors are causing the country to age rapidly. China also is home to the world’s largest number of people with cancer and other diseases requiring lengthy and expensive treatment. “China is going to be the oldest country in the world,” she said. “China has to innovate.” To illustrate the scale of the challenge, she noted that when the Obama administration invested $250 million in personalized medicine at one point, China countered with a $9 billion investment. 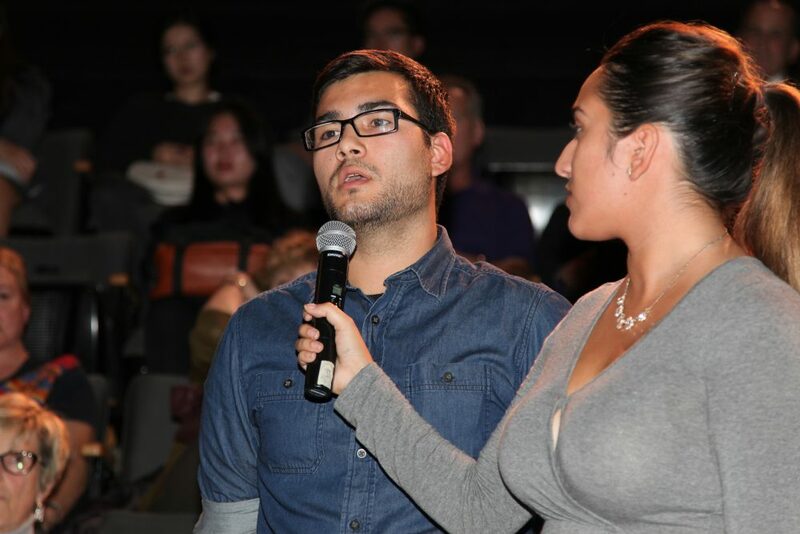 The harder question, panelists suggested, is whether China can achieve leadership. Xia, the UCSD political economist, said that Chinese manufacturers are struggling, and that its economy’s heavy competition and the lack of intellectual and other property rights discourage innovation. 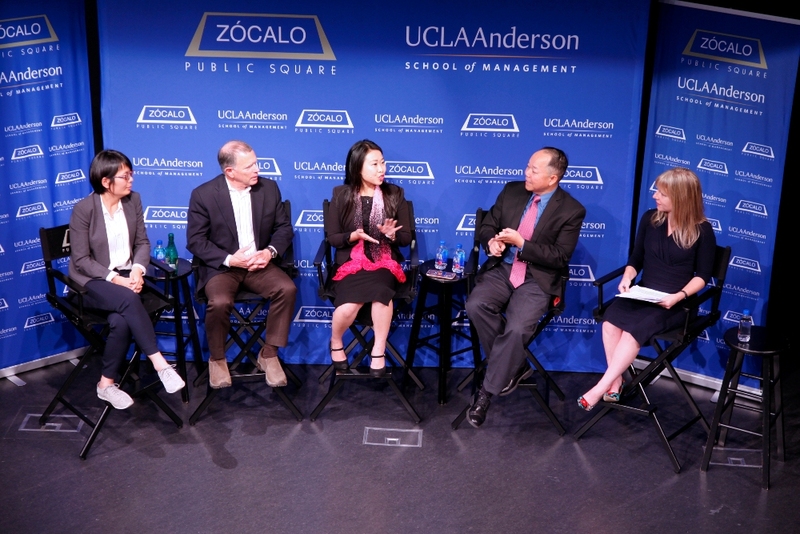 Tang, of UCLA Anderson, said that China has huge strengths that put it in a strong position—he called them the four C’s, for Culture (of trade and entrepreneurialism among its people), Customers (given China’s massive and growing middle class), Capabilities (it’s producing 500,000 graduates in STEM fields annually), and Cash (given the high savings rate). But in order to lead globally, China needs to make the difficult shift to a service economy, and become better at building global brands and developing leadership of major companies that allows for succession between generations. “Take Alibaba—what happens after Jack Ma? No one knows,” Tang said. 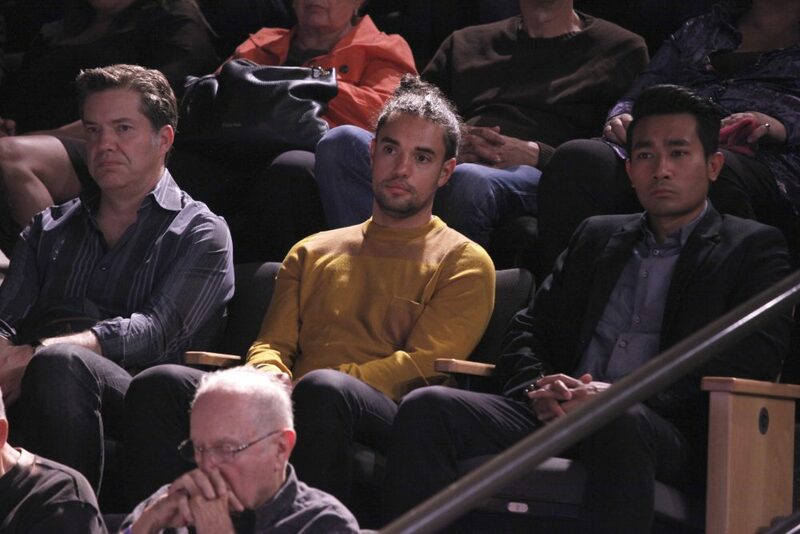 During the question-and-answer session with the audience, panelists were pressed on whether China could ever really lead without becoming an open society, or without becoming more of a market economy and less of a planned one. In response, Nickelsburg noted that China has made tremendous advances as a planned economy, and should continue to make progress on its current path, given its political leadership, for the foreseeable future, even without market changes. “Don’t mistake Xi Jinping for Adam Smith,” he cautioned. Christopher S. Tang, UCLA Anderson business administration scholar. 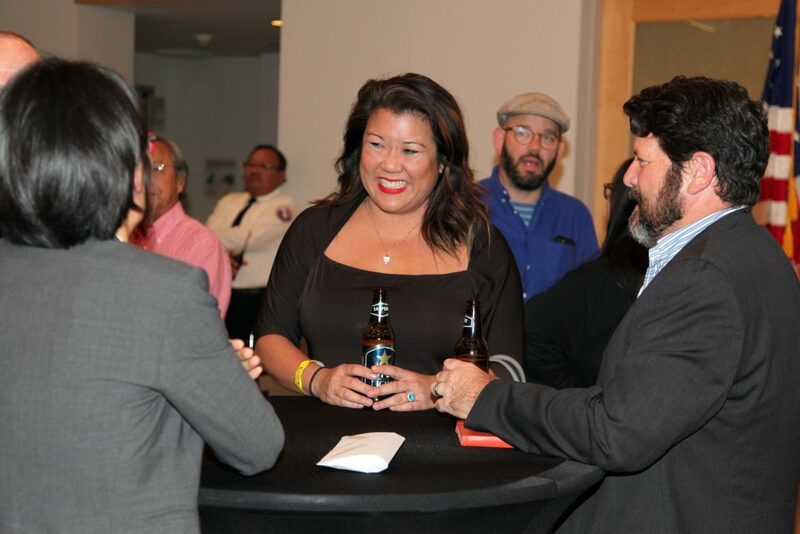 Julie Makinen, former Beijing Bureau Chief, Los Angeles Times speaks with guests at the reception.